“Unafraid to name God in a school book!” A must-have textbook for home-school parents and English teachers. Eighth grade level spelling and vocabulary skills lesson textbook using poetry as the basis for reading, spelling, vocabulary, writing and recitation lessons. To achieve the highest level of reading comprehension, there is no shortcut to – or substitute for – learning to use tens of thousands of words in their various contextual applications. Easy-to-use lessons encourage students to read and appreciate poetry while building vocabulary and spelling skills in the quest for enhanced reading comprehension. General EALRs included. Part of the RSVP Reading2Presentation Skill-Building Series. A must-have textbook for home-school parents and English teachers. Tenth grade level spelling and vocabulary skills lesson textbook using poetry as the basis for reading, spelling, vocabulary, writing and recitation lessons. To achieve the highest level of reading comprehension, there is no shortcut to – or substitute for – learning to use tens of thousands of words in their various contextual applications. Easy-to-use lessons encourage students to read and appreciate poetry while building vocabulary and spelling skills in the quest for enhanced reading comprehension. General EALRs included. Part of the RSVP Reading2Presentation Skill-Building Series. Important Disclosure: For public school teachers and curriculum departments, the study text in this book is 100% evangelical Christian material. A must-have vocabulary and spelling textbook for both home-school parents and English teachers. 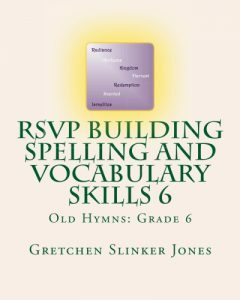 Sixth grade level spelling and vocabulary skills lesson textbook using 100+ year old hymn lyrics as the basis for coordinated reading, spelling, vocabulary, writing and recitation lessons. To achieve the highest level of reading comprehension, there is no shortcut to, or substitute for, learning to use tens of thousands of words in their various contextual applications. Easy-to-use lessons encourage students to read and appreciate poetry while building vocabulary and spelling skills in the quest for enhanced reading comprehension. General EALRs included. Part of the RSVP Reading2Presentation Skill-Building Series.